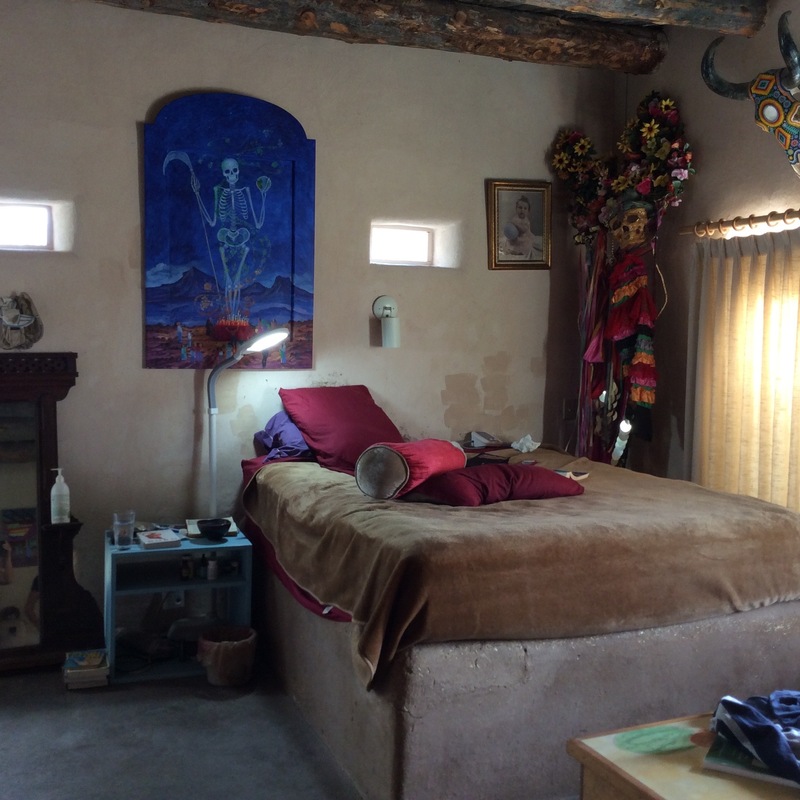 Many remarkable people have lived here and continue to make Taos their home but none, in my humble opinion, are so quintessentially of this place as Anita Otilla Rodriguez. Her mother, an incredibly talented painter, despite having had her hands severely crippled by polio as child, moved here from Austin, Texas, to study art and met Anita’s father, a pharmacist and the co-owner of the local drugstore on the Plaza. This unlikely couple – the daughter of Anglo-Saxon privilege and the son of ten generations of Taosenos carrying the blood of the land in his veins – fell in love, married and raised their daughter in this valley even as the shadow of War loomed large all over the world. 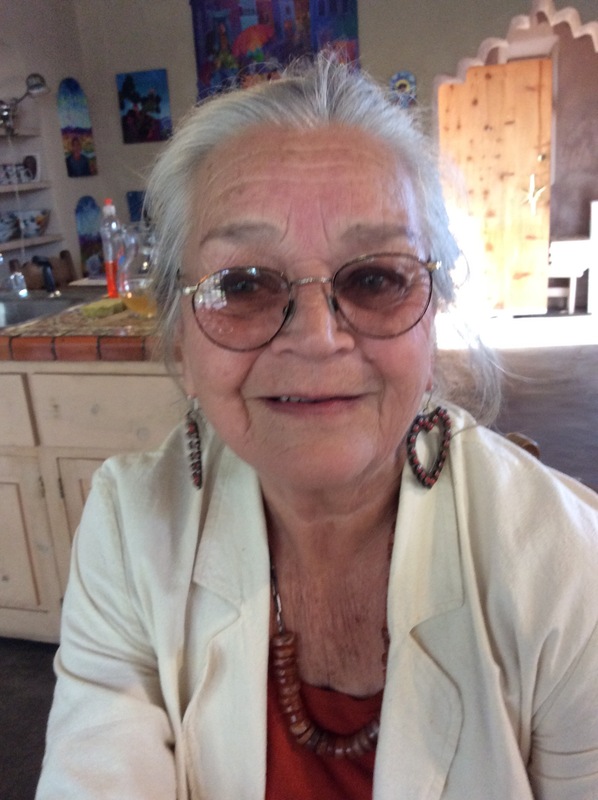 Born here, in the early spring of 1941, with three hundred year old roots in this valley, Anita exemplifies all that Taos has been and is still becoming. 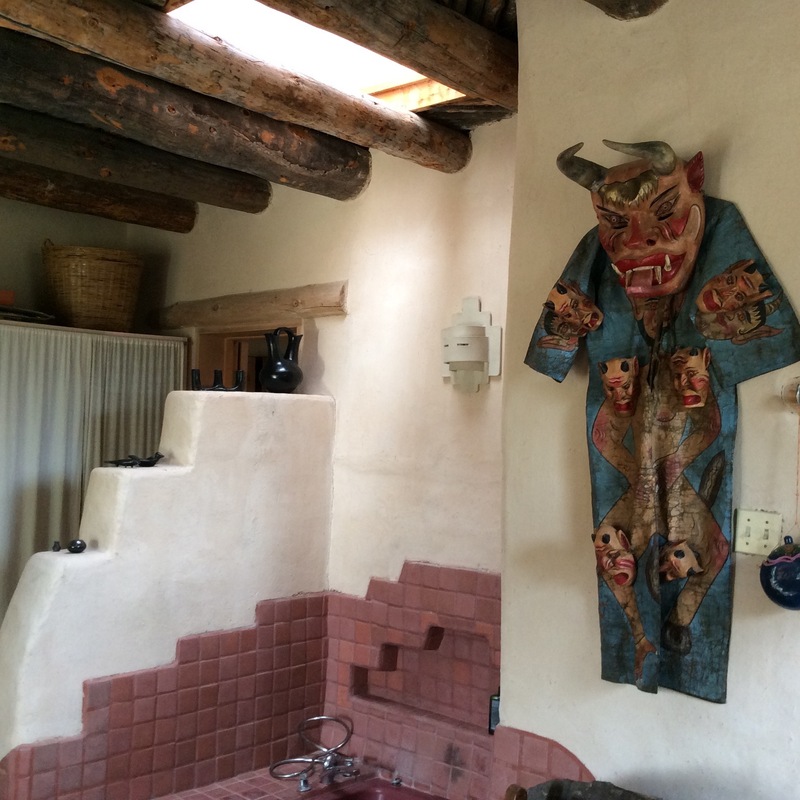 During the 40’s, Taos was still peppered with a few of the infamous characters who colour its Mid Century history; the Triumvirate of Mabel Dodge Lujan, Dorothy Brett, Frieda Lawrence were still here, as were several others who had followed the call to create in the Desolate West. Anita remembers them and the others who have since become cultural icons. What a rich childhood, I exclaimed. Coming of age in this fertile and culturally rich environment, it is not too surprising that both Anita and her sister, Sylvia Rodriguez went on to great achievement and acclaim in their respective fields, both, in different ways, deeply analyzing the complexities of cultural collision and confluence. 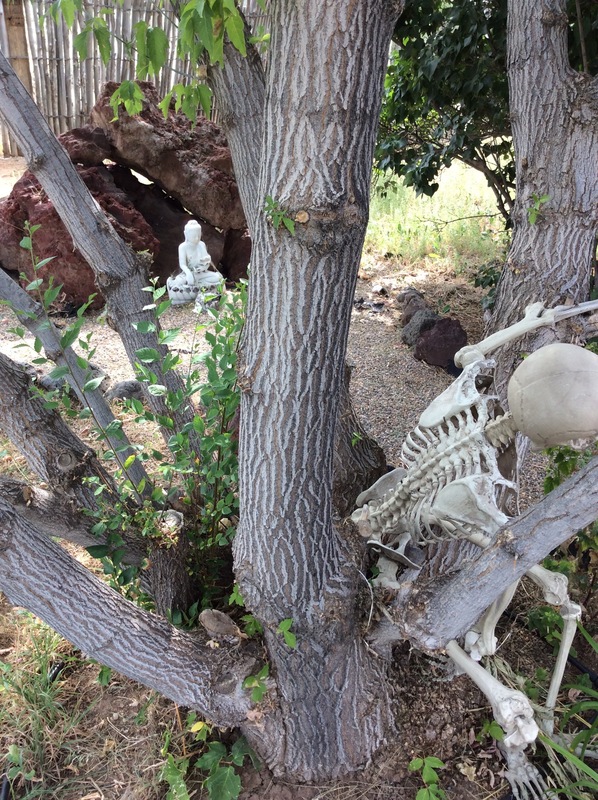 Racism – from every direction – was a constant factor among Taos children – beautiful by any standards, doted on and spoiled by her mother, she was golden-haired and green eyed, with the olive skin of her father’s Mestizo Heritage. To his family, she was a Coyote. In Native folklore, the Coyote is the Trickster, not to be trusted, and having been labeled with this suspect epithet, Anita made her way through the in-between world, inventing her own path, with little or no precedent to guide her. She recalls visits to her mother’s family in Austin, the Antebellum mansions and silver tea services. The whispers in the kitchen. Wherever she was, she was always on the outside, looking in. These days she’s on the inside, looking out. She grew up just a few blocks north in fact, on the corner of Placitas and Lund. Her sister Sylvia was born eight years after her and she remembers things changing around that time. At sixteen, Anita went to Colorado College and after graduating she moved to San Francisco where she found a place to rent in the Haight. Were you politically involved and active then? I asked her. “Not really, “she laughed, “I think I was more actively involved with Shemai’s father.” Her first husband was African-American, Anita was mixing up the bloodlines a little more, evening things out a bit. When did you become politicised? I pressed her. “Oh I think around the age of six.” She said guilelessly. I felt stupid for asking. 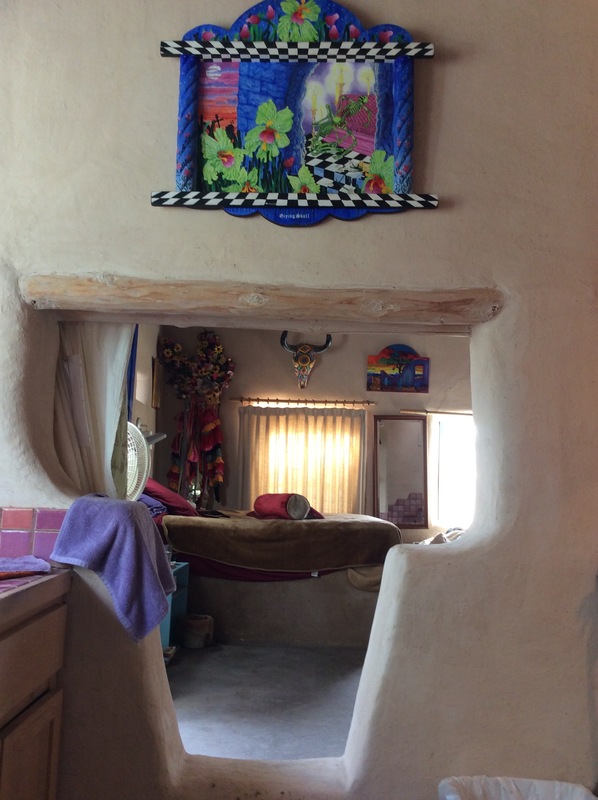 During the Sixties Anita was in the center of the Zeitgeist, living in the Haight, and then in Berkley, witness to the turbulence and changes of the era, so that by the time she returned to Taos, she was already in the process of becoming who she authentically is. Building, as in becoming a traditional enjarradora and running her own construction business for the next twenty odd years. I asked her how she came to do that work. 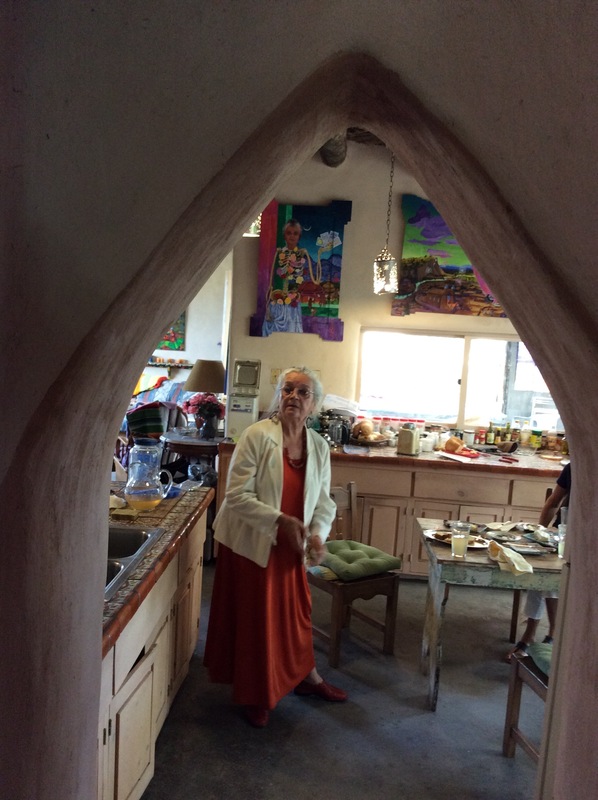 She went to Egypt in 1982 to study and apprentice with the Internationally renowned architect Hassan Fathy, who worked with traditional (mud) building techniques. Upon returning to the States, she was the recipient of the Wonder Woman Award and the Coors Company Award (which she returned after learning of their environmentally unfriendly practices). Ms. Magazine featured her prominently as did several other National publications – a woman on scaffolding was in those times, still an anomaly. “I got a lot of publicity.” She said smiling. At the ripe old age of forty-seven, Anita decided it was time to get down off the roof tops and start painting seriously. 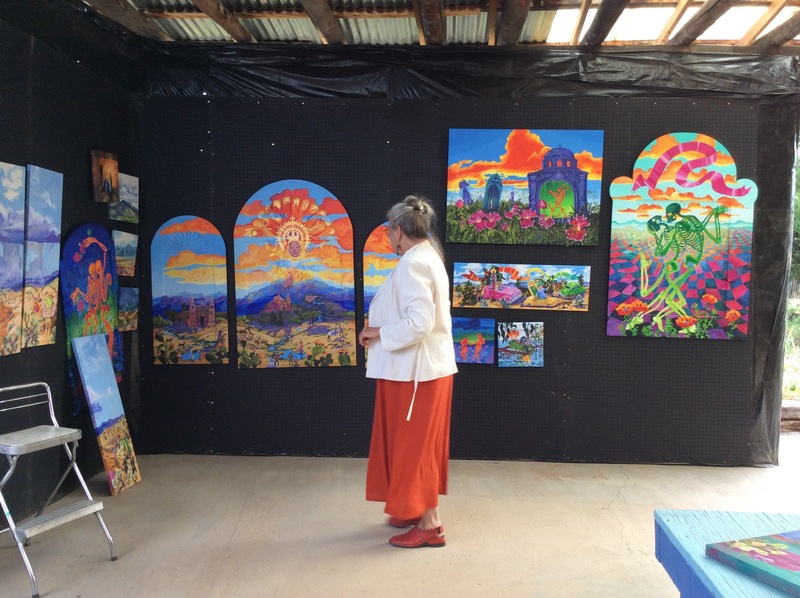 She retired from the construction business and became a professional artist. That’s when I met her. 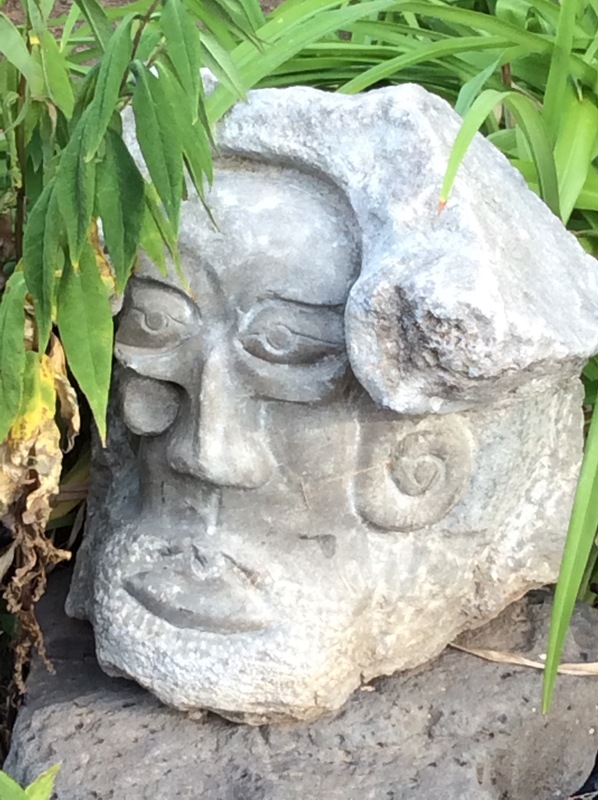 I had arrived back in Taos after a decade in the City, when she appeared in my life like one of Carlos Castaneda’s Naguals, ready to guide me through the labyrinth of Northern New Mexico’s bloodied history, making certain, that I would forever remember lessons learned; lessons that at times have brought me to my knees. Brilliant, erudite and articulate, she at once intimidated and inspired me. I was totally captivated by her childlike ability to be completely in the moment together with her formidable curiosity and intelligence. Who wouldn’t look up to a woman such as she? Both of us were part of the late Jane Hardy’s writing group back then, and for a time, Anita and I would meet early in the morning, after my children had gone to school, at the old El Pueblo Cafe, where we’d eat bowls of chile and gorge ourselves on sopapillas washed down with cup after cup of terrible coffee, as we wrote the mornings away. Occasionally we’d visit her mother Grace, whom I got along with very well, and have lunch with her. Other days we’d drive somewhere, park the car and walk to a place we liked the look of, and draw it together; she encouraged and critiqued me and forced me to work harder and do better than i ever imagined I could. During those years, Anita and I did not speak. It was as if she had never been in my life. Besides my own father, an impossibly brilliant man, I have had but one other mentor in my life, a man as great an artist as she. He showed up in my mid-twenties, she a decade later. When the student is ready etc. Curiously both were born in the same year and both share my Chinese Zodiac Sign, the Snake, being twelve years older than I. A classic autodidact, I had until meeting each of them, never felt anyone could teach me more than I had already learned on my own. In Meetings with Remarkable Men, Gurdjieff meets a bookseller named Yelov, who astounds him with his phenomenal knowledge of languages. Gurdjieff, who himself spoke eighteen languages at the time, felt inept. Yelov asked him what he was looking for. “I want to know why I am here,” Gurdjieff replied. One only discovers that knowing, when one is left alone with one’s own thoughts and self – shadow and all – and this is what these two remarkable people gifted me with. When Anita and I met to talk about this post, it was as if no time at all had gone by. 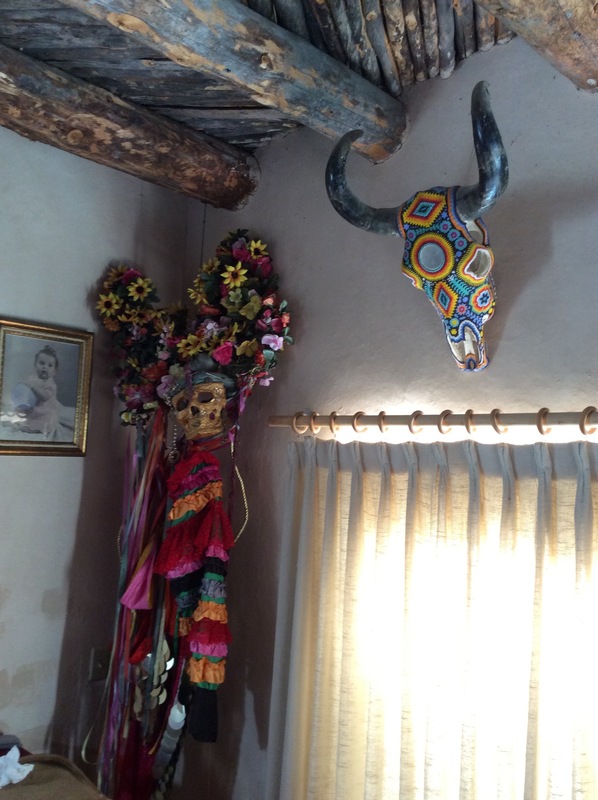 Again I had the extraordinary feeling of having wandered into Castaneda territory; a magical world outside of Time. 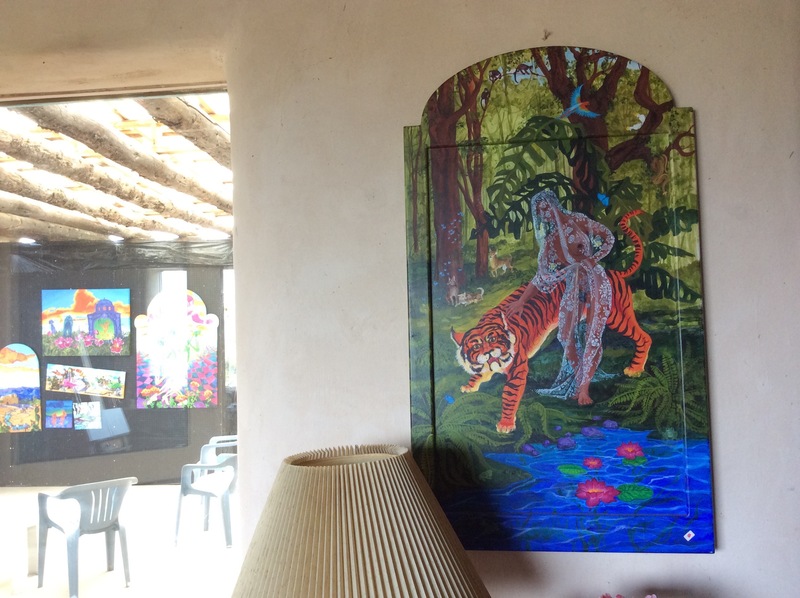 I looked at all the new art on the walls of the home she had just completed when I first met her; organically and intrinsically connected as if one grew from the other, like the shoots of a branching tree. The colour she uses so bravely – almost defiantly, much like a child let loose with a big box of crayola crayons – engulfing me like so many rainbow rays of healing light – there is magic in these works, beyond the subject matter. Anita’s relationship with colour itself is the crux. 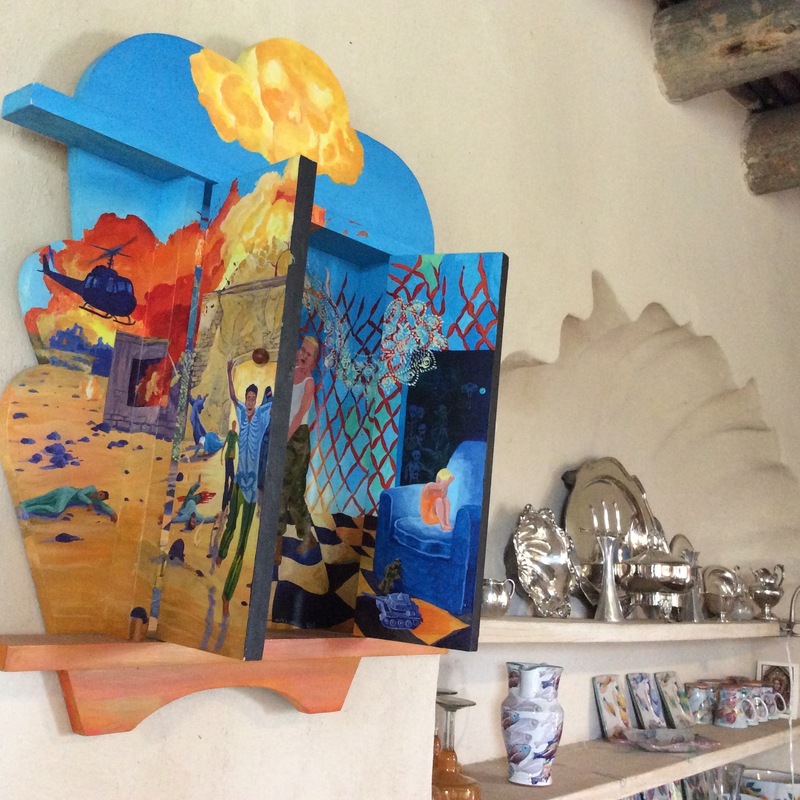 Perhaps that is why her art has such a profound effect on the viewer; in a sense these paintings are stories, histories and allegories that beg for forgiveness – almost an ongoing apologia for the Conquest that forever changed the face of the Americas – while at the same time, graphically illustrating the core wounds at the heart of the proverbial darkness. Anita has never been afraid of speaking truth to power. Not one to rest on past laurels, Anita has plenty of irons in the fire. She’s passionate about getting a new program in the schools – Reading To End Racism – and stands by her belief that it’s the language of the Heart that ultimately heals the ancient wounds rooted in fear and ignorance. 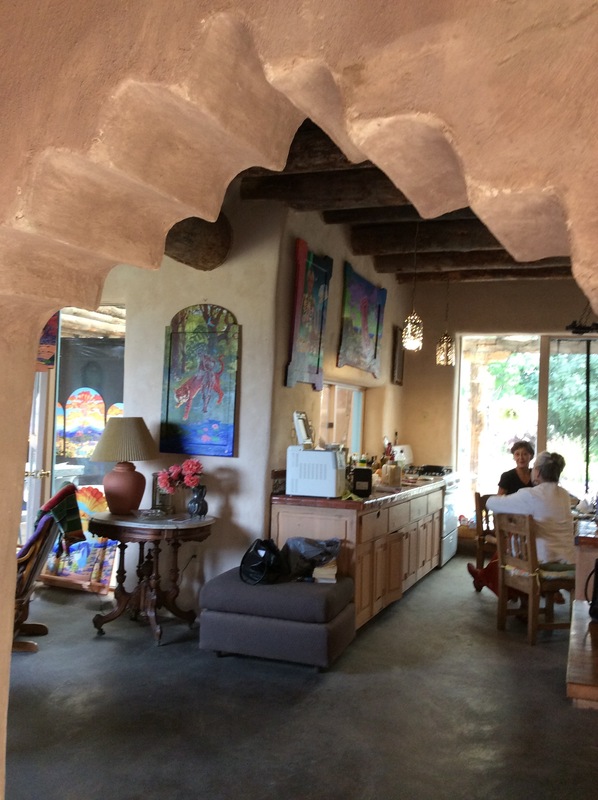 She has a new book out next year published by UNM Press, edited by the wonderfully talented Diana Rico, entitled Coyote In The Kitchen (yes, she is also a fabulous cook) and this weekend, she’ll open the doors of her beautiful home and studio to the public (Sept 5, 6 & 7, from 10:00 – 5:00) for the TAO studio tour. 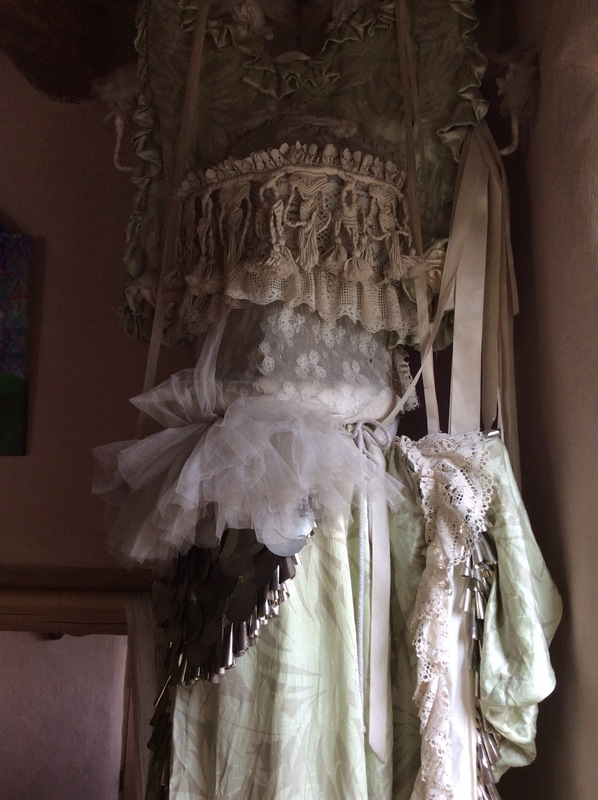 On September 25th, Anita, El Moises and Father Bill will have a show of their work in the old jail on the Plaza with an altar to Santa Nino, (the patron Saint of prisoners among his many constituents). 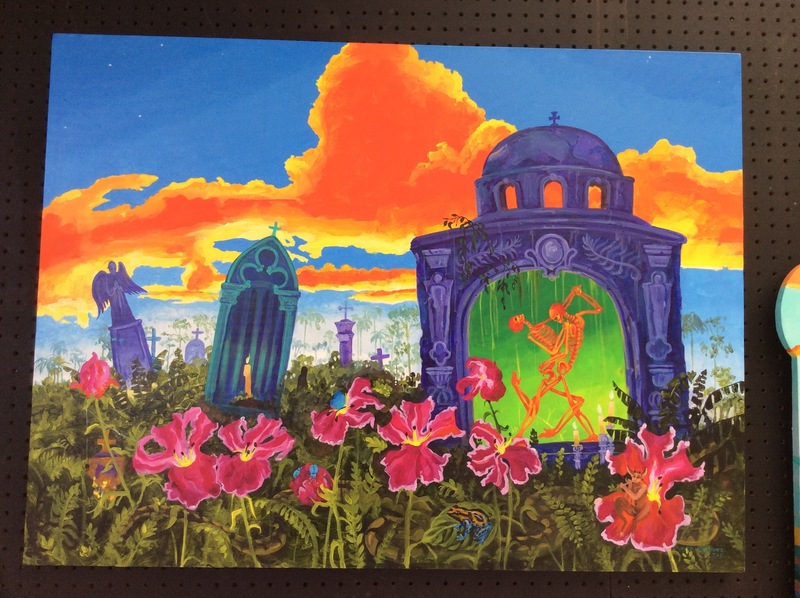 In October, Anita is offering a Day Of The Dead, three-day painting workshop in her home studio. For more information about that and all of the above, be sure to visit her site linked below this post. Oh, and be prepared to feast your eyes on some serious beauty. Photographs of Anita at home, by Janie Romer. August 31, 2015 in Art. Nice to visit with you Anita. I look forward to doing in in person some time. Thanks Iris, I need to get you on here soon too! The best article yet! I love this woman! She speaks to my heart! What amazing talent she is!!! Thank you Toni – Anita is truly a remarkable and inspiring woman. It was a joy to write this piece! Great article and photographs! Anita is a gem in the community. A sage and student at the same time. We are all fortunate to live in the same community at the same time with Anita. Thanks for commenting Daniel, I fully agree!